Lake trout love cold water, and are a great species to target when ice fishing. They can grow to an extremely large size, making them a challenge to land through the ice. Below is a list of the essential gear you need to catch these monsters from the deep. Photo credit: Izumi Outdoors Inc.
Lake trout are usually caught over deep water, and they can be anywhere in the water column. 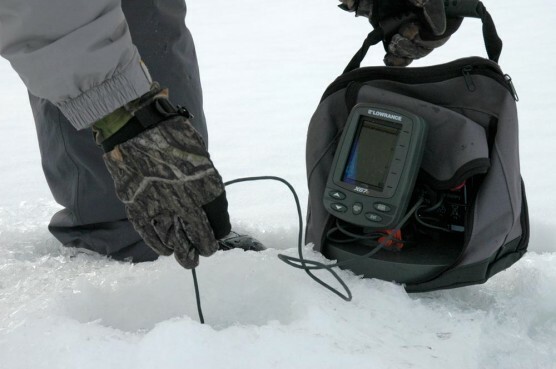 A sonar is essential to spotting the exact depth where fish strike. It can also be useful for identifying schools of baitfish that lake trout might be feeding on. Use an auger that has at least an 8" blade. If you are targeting really big lakers, then use a 10" blade. The larger hole size will make it easier to land big fish. Ice fishing rods for catching lake trout should be 24-36" in length. They should be medium or medium-heavy action. 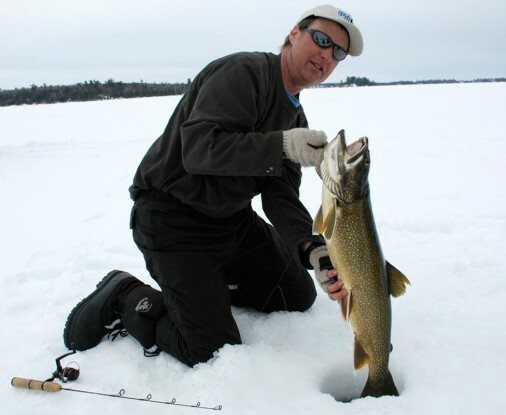 Both spinning and baitcasting reels can be used when ice fishing for lake trout. Select one that has a high capacity spool. Lake trout are often in deep water, and big ones can peel off a lot of line. While not essential for catching lake trout, a tip-up is a good thing to bring along. If regulations allow, it can be set in a second hole while you jig nearby. Start by setting it with a live minnow that is a bit up from the bottom. Adjust the depth if you catch anything higher with your jigging rod. The ideal line to use when ice fishing for lake trout is 10-20 lb braid. This line his no stretch, making it a great choice for fishing in deep water. Use an 8 lb fluorocarbon or monofilament leader. Attach the leader to the main line with a small barrel swivel when fishing with tube jigs. This will prevent line twists. 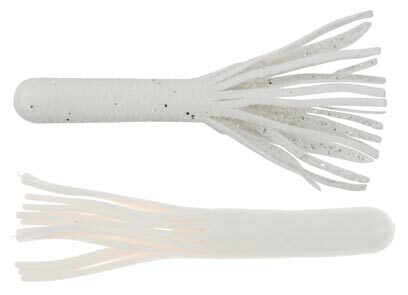 The most successful method for catching lake trout is by jigging a tube. Use tubes that are 2-4" long. Bring a variety of colors, but white, smoke and silver fleck are the most popular. Airplane jigs are also a good choice. Keep a variety of sizes and colors in your ice fishing tackle box. You can tip them with live minnows. 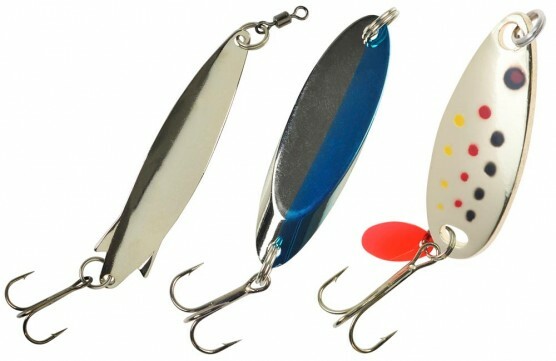 The flash and falling action of spoons can be great for attracting lake trout. Use large ones that have a lot of flash to catch the attention of fish in deep dark water. Live minnows can be used on a quick strike rig or to tip an airplane jig. Try to match the bait you use to the most likely species that lake trout will be feeding on. Check local regulations first, but cisco, smelt, emerald shiners, golden shiners, herring and perch are all good choices.